Size 4/6 - $44.99 Size 7/8 - $44.99 Only 7 left! Not all pirates are classless scoundrels! Hector Barbossa isn’t. Despite traveling the the high seas in search of any treasure he can get his hands on, he manages to keep up appearances. He doesn’t just walk around his ship in just any old outfit that he finds laying around in his bedroom, no! He makes sure to wear his best duds while he’s crossing swords with every brand of bandit and buccaneer. If you want your child to become a pirate, Captain Barbossa may be the perfect pirate role model for your child. 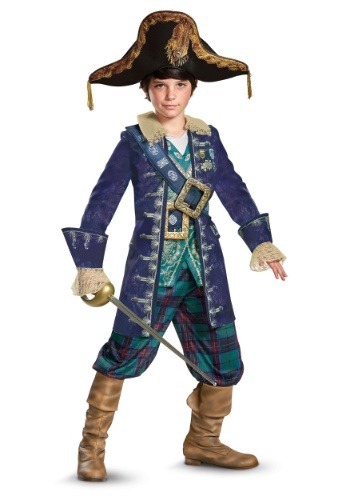 And the best place to start when trying to get your child geared up like a pirate captain begins with this licensed outfit from the movie. This Captain Barbossa child costume is a deluxe costume based on the character from the Pirates of the Caribbean film, Dead Men Tell no Tales. The outfit includes a regal looking jacket with an attached tunic, which is certainly not your run of the mill kind of pirate gear. It also comes with the buckle, pants and hat pictured. (We bet that Jack Sparrow wouldn’t be able to pull off a look like that in a million years.) When your child puts this entire ensemble on, he’ll be ready to take command of his very own pirate ship for the adventure of a lifetime. We’d like to remind you that your new young captain is going to need a crew, which is the perfect opportunity for you to find a Pirates of the Caribbean costume of your own to wear! After all, nothing quite says, “I love you,” like wearing a pirate costume and heading into battle with your child.